EQ8 is redesigned with a friendly new look that includes large interface elements for faster, more intuitive learning. 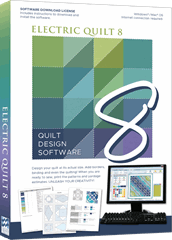 New features: EQ8 comes with more than 40 new and updated features, including thousands of new block designs and fabrics. The possibilities are endless.